Crispy chips and three flavours of super tasty cocktails as an excellent starter! Soak quinoa overnight and then let them sprout out of direct sunlight, rinsing at least twice a day, until the grains have begun to sprout. Quinoa is very good as it sprouts very quickly - about 12-24 hours. Put the sprouted grains into a big glass jar (or divide them equally between two jars) and pour the filtered water into the jar(s). Cover it with cheesecloth and secure it with rubber bands. Store the jar in a warm place out of direct sunlight for 2 days. Stir the contents of the jar at least once a day. The rejuvelac is ready when the water turns cloudy and white: strain the liquid into clean bottles and set aside the grains (they can be be used in "leftover" recipes, such as nomeatballs). Rejuvelac will keep in the fridge for about 4 weeks. Divide your rejuvelac among 3 1-liter bottles with a large mouth opening (or 3 big jars). 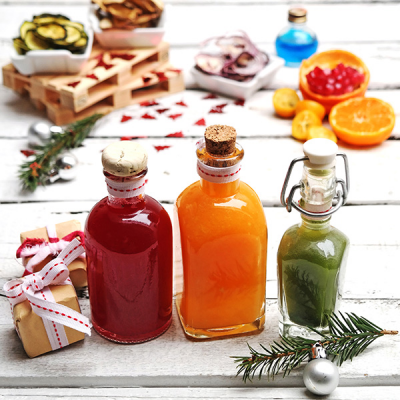 Add freshly squeezed tangerine juice to the first one, pomegranate and beetroot juice to the second one and kumquat juice plus barley grass powder to the third one. Shake well and serve immediately.